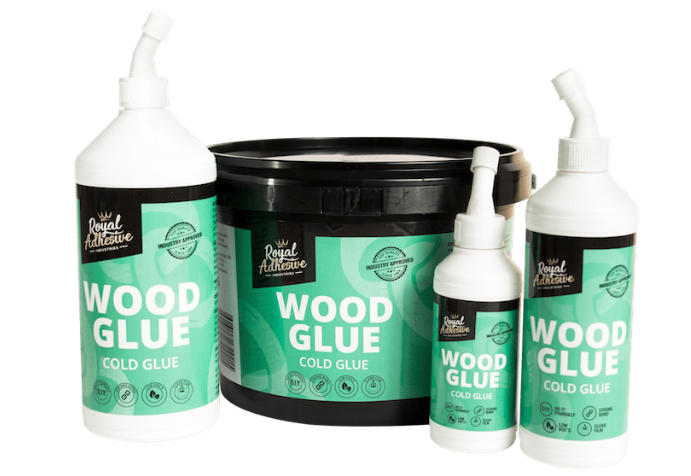 Royal’s Cold Wood Glue is a unique low VOC formula that we believe to be one of your greenest wood glues of choice. The product provides a clear non-visible glue line with strong grab and strong bonds which make it suitable for general furniture/woodwork applications and paper. Also works well in dowels, joints, and tenon type applications. This product cannot be used on plastic. Surfaces must be clean, dry and free from dust. Wood joints should fit tightly. Apply glue to one or both surfaces and clamp for at least 2 hours for softwood and up to 8 hours for hardwood. Wipe excess glue with a damp cloth. Clamping time is dependent on weather conditions. NOTE: In cold weather, hardwoods should be lightly sanded before applying adhesive. Apply adhesive to both surfaces to increase working time. Clamp time should increase in cold weather. Not suitable for damp wood or where the moisture content exceeds 14%.